Start the day off by exploring the art in nature as you go for a walk through Nathan Manilow Sculpture Park to encounter more than 29 major works of contemporary sculpture, set within the wild prairie swales of Governors State University in University Park. 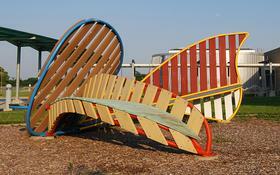 Have a seat on the "Throne (for Dr. Martin Luther King Jr.)" by Artist Ted Sitting Crow Garner. The artist's multi-hued color scheme reflects King's dream of a United States where children of all ethnic backgrounds could grow up with the same opportunities for social and career advancement. 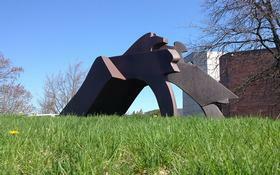 While at Nathan Manilow Sulpture Park, take a look at the art of famous sculptors Richard Hunt and Martin Puryear. Hunt’s stature among American sculptors has been recognized by numerous awards and he has two pieces at Nathan Manilow with Large Planar Hybrid and Outgrown Pyramid II. Large Planar Hybrid reflects Hunt's unique vision and mature style. He employs bird-like forms in reference to mythological themes, such as Icarus and the individual freedom which birds represent and their resonance with the African-American experience. The viewer's understanding of this richly rewarding work unfolds over time as position, light and seasons shift. Outgrown Pyramid II has combined elements of biomorphic and geometric abstraction. Martin Puryear's Bodark Arc is an example of Land Art, so large it can be fully appreciated only by viewing from the air. Puryear orchestrates landscape and scale along with personal and cultural references to offer a retreat from our daily activity. As you leave Nathan Manilow Sculpture Park, take Interstate 57 North and notice the signs dedicated to the Tuskegee Airmen. 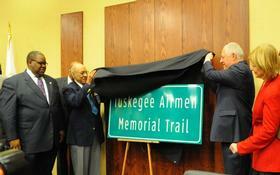 In 2012, the State of Illinois dedicated the Tuskegee Airmen Memorial Trail along the stretch of Interstate 57 between Exit 339 at Sauk Trail and Exit 358 at Wentworth Avenue in Chicago. These are World War II heroes who, in 1941, formed the first African-American air squadron based in Tuskegee, AL. In celebration of the Tuskegee Airmen Inc.'s Chicago “DODO” Chapter, this is a dedication of the Tuskegee Airmen's commitment to our country and their important place in African-American History. After marveling at large art from famous African-American artists, it’s time to shop small. You’ll never know what you may find when you walk through The Villager Card & Gift Shop’s beautiful red door. 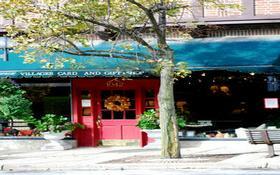 There are distinctive teas, fabulous jewelry, handbags, baby items, candles and more to delight and surprise you. For "The Woman," The Villager has a wide assortment of specialty items. 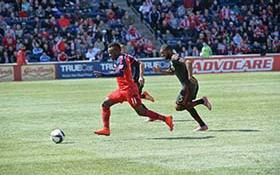 Their goal is simple, to give you the newest products available and provide you with a unique selection of top quality merchandise. Your nose is going to love visiting The Villager Card & Gift Shop as the welcoming scents fill the air. “Between the Butter nail polish, La Vie Parisienne jewelry and lavender luggage sachets, I was delighted at how each item in the store seemed to have a story behind it. I found myself wishing I had more friends to buy gifts for just so I could justify purchases,” said shopper Isabelle from Long Beach, CA. After building up an appetite from walking and shopping, pull up a chair at Flossmoor Station Restaurant and Brewery, where they offer a unique train themed décor and craft beer selection. Before you head off to the Pullman National Monument, pair the Pullman Pork Beer-B-Que Sandwich with the Pullman Nut Brown beer. This award winning beer is a traditional English brown ale with a nutty aroma and a very well rounded body of flavor. If you are not much of a “beer person” try the Goober Brau Root Beer or make it a float at the end of your meal. Now that you have enjoyed a Pullman themed meal, it’s time to learn more about the world’s first planned industrial town. In 1906, Pullman was designated the “World’s Most Perfect Town” only to find itself near demolition in the mid-20th century. 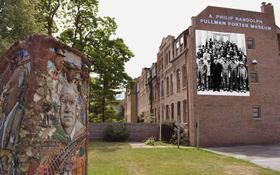 Visit the Pullman Foundation Visitors Center to find out how it bounced back to the track of prosperity. Walk along the maroon row houses on your way to Hotel Florence and marvel at the bright red bricks of the Pullman Factory. You will sense a special feeling as history resonates around you. On February 19th, 2015, President Barack Obama signed an antiquities act designating the town of Pullman, a National Monument due to the community’s involvement in policy-shifting history. Discover the faces and places that tell the experience of Pullman and enjoy Illinois’ newest national treasure in the backyard of the Chicago Southland. The permanent collection displays exhibits which are pertinent to the study of the American Labor History with a focus on the African-American contribution. Exhibits provide insight on the African-American experience in America’s organized labor movement, including the African-American Railroad employees as they relate to the Pullman Company, with a significant focus on A. Philip Randolph, the Brotherhood of Sleeping Car Porters (Pullman Porters) and their impact on the Great Migration and the American Civil Rights Movement. End the evening with a little Southern flair and a lot of Flavor! The concept here is unique and touches every aspect of an enjoyable dining experience: “flavor-ful” food, exceptional service and award winning jazz that is a true treat in the Chicago Southland. You MUST try the shrimp and grits when you visit. Treat yourself by attending Jazz Night on Thursday through Saturday and be amazed when the restaurant transforms into a jazz supper club. 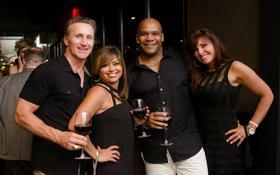 Flavor Restaurant, Inc. strives to excite your palate, provide excellent service and warm your heart. A narrow stretch of land on Chicago's south side is often referred to as near south or as mid-south, but is more commonly known as Bronzeville. The Great Migration of the early 1900s from the South brought many African Americans to south of Chicago. Bronzeville became a vibrant community inhabited by musicians, businessmen, politicians, entrepreneurs and millionaires. Bronzeville boasted the first black owned and operated bank and insurance company. This area also played host to such jazz and blues greats as Louis Armstrong and Nat "King" Cole. Other noteworthy residents include author Lorraine Hansberry, aviator Bessie Coleman, Dr. Daniel Hale Williams, Congressman William Dawson and local publishing magnate, the late John H. Johnson. When you visit you’ll see the Monument to the Great Northern Migration by sculptor Alison Saar. 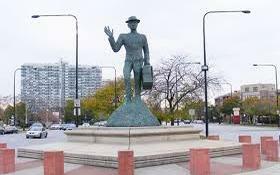 This bronze figure is a testament to the thousands of African Americans who migrated to Chicago in the early 20th century in search of greater freedom and opportunity. The traveler’s hand is raised in salutation to his new home. In his other hand he carries a worn suitcase symbolic of his journey, dreams and talents. The figure is oriented to the north, symbolizing the traveler’s destination. 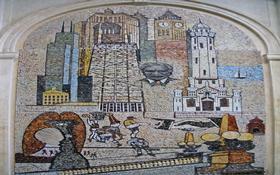 The four Chicago Community Areas of Grand Boulevard, Kenwood, Douglas, and Oakland comprise Bronzeville, which is historically known as the “Black Metropolis.” Surrounding stone pillars explain its rich history as a center of black culture, and many argue that the developments in the ‘20s and ‘30s in this area rivaled that of Black Harlem. The Illinois Institute of Technology (IIT) is located in the heart of the neighborhood. Also located in Bronzeville are Johnson Publications headquarters (Ebony and Jet magazines), Pilgrim Baptist Church (designed by Louis Sullivan and Dankmar Adler) and the 47th Street Jazz District. 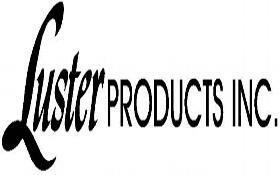 While you’re near Bronzeville, make certain to tour the headquarters of Luster Products, Inc. As you may know, Luster is the leading African-American owned manufacturer of premium personal care products servicing people worldwide. Luster Products' brands include the Pink Brand, S-Curl, PCJ Pretty-n-Silky & Smooth Roots, YOU children products and products for stylists. During your tour you’ll learn the history of Luster Products and talk to the employees to learn more about what they do and each product. You’ll leave the tour with your very own Luster Products Care Package. Located in Chicago's prestigious Bronzeville Community, Pearl's Place offers a unique experience, combining delicious home-style foods with the service and attention of a fine-dining restaurant. Offering the best, freshly-prepared breakfast, lunch and dinner buffets in town, Pearl’s Place features southern soul food selections prepared and served by our professional and accredited chefs. Pearl's Place is proudly owned and operated by a multicultural group with deep roots and history in the community, having lived with and served its residents (and all of Chicagoland) for more than 30 years. Now that you’ve eaten at Pearl’s Place, explore the pearl of Bronzeville at The DuSable Museum of African American History, the first museum of its type in the country and recently granted Smithsonian Affiliation status by the Smithsonian Institution. The DuSable Museum, established in 1961, is only the second arts, culture and education facility in Chicago to receive Smithsonian Affiliate status; the other is Adler Planetarium. 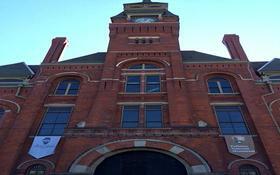 The partnership permits DuSable to borrow Smithsonian artifacts and access traveling exhibits. Similarly, the Smithsonian will gain access to rarely seen paintings, sculptures and more that comprise DuSable’s collections. 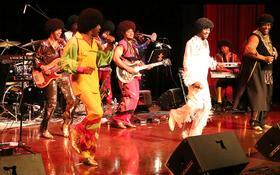 Groups of all ages are welcomed at The DuSable Museum. One of the newest exhibits excites the eyes and stirs the soul. It’s called the DuSable Masterworks Collection and it highlights the works of some of the greatest and most prolific African American artists such as Henry Ossawa Tanner, William A. Harper, William Edouard Scott and Archibald Motley, Jr., among others. This unique, diverse and beautiful collection of work is the first in a series which allows visitors to engage with the DuSable Museum’s world-class Fine Arts Collection. The depth and breadth of these accomplished artists provides the public with a thirst and desire to see more. The goal of The DuSable Museum is to inspire appreciation of the achievements, contributions and experiences of African Americans through exhibits, programs and activities that illustrate African and African-American history, culture and art. What’s the one thing that can make fried chicken even better? Having waffles along with syrup drizzled on top, of course. 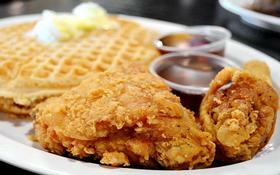 Chicago’s Home of Chicken & Waffles is really known for serving good ole’ Southern Comfort food. All of the food is prepared with the freshest ingredients and served the way Grandma would serve it back in the day. 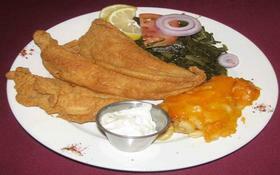 You’ll enjoy all of their generous menu selections consisting of fried chicken, southern fried catfish and grits, grilled salmon, lemon pepper grilled catfish, peach cobbler, sweet potato pie and of course, the famous waffles, just to name a few. When you sit down at Chicago’s Home of Chicken & Waffles, you’ll think you’re at Grandma’s house! On your last day in the Chicago Southland area step back in time to understand what it was like to follow the escape route on which numerous slaves traveled to freedom through the Underground Railroad. The "Underground Railroad" became a major impetus leading to the eradication of slavery. Runaway slaves ("passengers") usually traveled to their destinations by night either alone or in small groups. Whenever possible black and white abolitionists provided food and shelter at stopping places known as "stations" or served as "conductors" providing transportation between stations. The Underground Railroad remained active until the end of the Civil War as black bondsmen continued to use the system to flee the horrors of slavery. Graue Mill and Museum in Oak Brook is one of the remaining "stations". 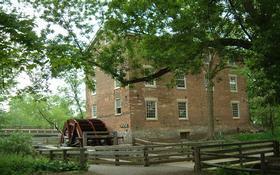 Frederick Graue, a miller by occupation, housed slaves in the basement of his gristmill. Graue Mill's location on Salt Creek, a tributary of the Des Plaines River, made it an ideal location for harboring slaves. Today, the exhibit "Graue Mill and the Road to Freedom" uses photographs, documents, a computer interactive system and additional displays to illustrate the issue of slavery, the Underground Railroad and the importance of Graue Mill in assisting fugitive slaves to escape to freedom. Now it’s time to “Wine” down and discuss the history you have learned at Cooper’s Hawk Winery and Restaurant in Oak Lawn. Since opening in late 2005, Cooper’s Hawk has received over 300 wine awards from various local, national and international wine competitions. The type of wines offered include sparkling, red, white, sweet red, blush, sangria, fruit, dessert and mulled. Start off the meal with the Crab & Lobster Bisque paired with a glass of Lux Chardonnay white wine. Try the Cabernet Zinfandel red wine with the Red Wine Braised Short Ribs. Also available is a Live Balance menu that helps you watch your calories while still enjoying your wine. Save room for a Cooper’s Hawk dessert favorite, Chocolate Pretzel Bread Pudding paired with an Ice Wine, which is a luscious mix of tropical and stone fruit flavors with a burst of tartness.